Doubling streams every two months since February, WatchMojo experiences yet another record month with 26,500,000 video views on YouTube. WatchMojo – one of the largest independent producers and distributors of premium video content – continued its torrid growth on YouTube with another record month in June with 26 million streams on the popular video site. Since February 2013, the company has nearly doubled the streams on its YouTube channel every two months, growing from 6 million in February, to 10 million in March, 14 million in April, 21 million in May and 26 million views this past June. In that same time period, WatchMojo's minutes of content watched per month has grown from 22 million in February to 114 million in June. 625% annually from 3.6 million in June 2012 to 26.5 million in June 2013. At a time when most video producers are striving to build distribution outside of YouTube in efforts to diversify revenues, June marked the first time that WatchMojo generated over 50% of views on YouTube. 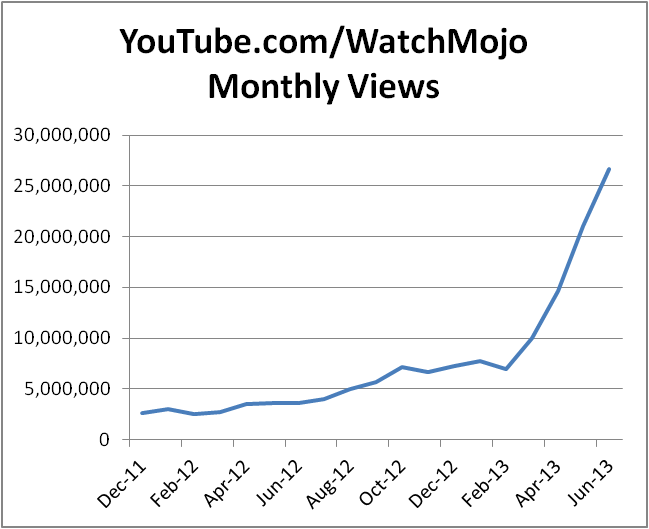 Across all websites, WatchMojo generated 52 million video views in June. All-time, WatchMojo has generated over 1.6 billion views; 260 million have come on YouTube. After adding 72,000 YouTube subscribers in May, WatchMojo added 99,000 more in June, raising its all-time YouTube subscriber count to 400,000. WatchMojo is on pace to reach 1,000,000 subscribers by year's end, a tenfold increase since January, making it one of the fastest growing YouTube channels this year. Over the past two years, YouTube has become ground zero in the video advertising space, with venture capitalists, Bertelsmann, Comcast, Time Warner, Dreamworks, and Google itself investing or acquiring YouTube-centric producers. This activity has been fueled by advertising spending on YouTube, which was pegged at $4 billion globally. The US video ad market is forecasted to more than double to $9.06 billion in 2017 from $4.14 billion according to researcher eMarketer Inc. Unlike many of the multichannel networks that largely aggregate individual channels on YouTube, WatchMojo owns all of the videos on its channel and has progressively increased its monthly output from 250 minutes in April to 350 minutes in May, and 395 minutes in June. its “This Day in Video” series, which retells history through video by covering the people, places and events that have shaped history and pop culture. As a testament to the company’s informational and entertainment value, WatchMojo has expanded its footprint in the education space by providing academic publishers with video programming to teach English and reinforce their traditional curriculum. "Our vision has always been to inform and entertain through video. The foundation of our catalog was lifestyle programming on evergreen topics, which we leverage to this day. But we've always sought to be a 'Wikipedia of video,' albeit with professionally-produced videos on every topic in the world," explains company founder Ashkan Karbasfrooshan. "As we grew our tentacles, partnered with a broader range of media companies and developed our own voice and audience, we've shifted focus to biographies, profiles and top 10 lists on the people, places, things, events and trends that shaped pop culture, that has made us a very unique channel on YouTube which stands out from the clutter," continues Karbasfrooshan, who funded the company with seed capital in 2006, never took on outside financing and rode the business to profitability in late 2010. The company finally broke even in November 2010 and has been profitable since, with profits growing nearly tenfold from 2011 to 2012, and on pace to double in 2013. WatchMojo Trivia, which features multiple choice and true/false questions and answers based on the company's library of 8,000 videos. "These tools also extend our product assortment into mobile devices where we already generate upwards of ten million monthly views. When you combine our web and mobile foothold with out-of-home - where we reach 50 million consumers in gyms, malls, cabs, airports and other retail outlets - we're getting close to reaching a cumulative global audience of 100 million video viewers each month," concludes Karbasfrooshan. WatchMojo informs and entertains through video by covering the people, places and trends that have shaped history. The company’s catalog of 8,000 videos has generated 1.6 billion cumulative video views online since 2006. Each month, the company reaches over 75 million consumers. In 2012, Digiday picked WatchMojo as one of three finalists, alongside CBS and HBO, in the Best Entertainment category at the Digiday Video Awards. Marketing Magazine named WatchMojo one of Canada’s Digital Media Companies to Watch in its September 2011 issue. Ernst & Young nominated Ashkan Karbasfrooshan for Entrepreneur of the Year in its 2012 media category. WatchMojo is profitable, privately-held and based in Montreal, Canada. Subscribe to YouTube.com/WatchMojo and suggest a video you want created on WatchMojo.